We’re in the midst of winter, and you have hopefully prepared your car for the freezing temperatures it’s going to have to deal with. Of course, getting your car to start is easy compared to driving on the snow or ice covered roads which are jam-packed with people driving recklessly, likely due to not waking up early enough to deal with the icepocalypse. It’s not unthinkable to go off the road, and if you’ve ever gotten stuck in a snow bank you know how much of a pain it is to free yourself from it. You can try using cinder blocks, cat sand, or nearby sticks, but sometimes none of that is going to be enough. If you want at least one more option before having to call AAA, then the Trac-Grabber might be able to help. 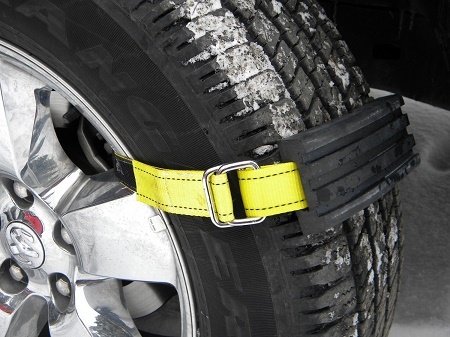 This is a device that you strap onto your tire which will give you a a fixed bump to drive over, rather than a stick or rock that will slide in the snow. Once it grabs any sort of solid ground, it will move your car back to stable terrain. This comes in a set of two which each measure 8 x 3 x 1”, and they’re pretty easy to install when you need them. It’s made of a very solid rubber, and will hopefully be more useful than any than any other Jerry-rigged fixes. While these are sort of pricey costing $49.99 for the set, they would be a last-ditch effort to save you when you’re trapped in a winter wonderland.